The U.S. Treasury yield curve officially inverted on March 22, 2019, when the yield of the 10-year note dropped below the yield of the 3-month bill. Many of the Federal Reserve's minions have been running around in all different directions as confusion reigns at the central bank. The lack of direction at the Fed coincides with an increased likelihood that the Fed will act to cut short-term interest rates in the U.S. as early as by September 18, 2019. Since the U.S. Treasury yield curve officially inverted on March 22, 2019, when the yield of the 10-year note dropped below the yield of the 3-month bill, many of the Federal Reserve's minions have been running around in all different directions as confusion reigns at the U.S.' central bank. Although it's April Fool's Day, we're not joking. In all seriousness, if you want proof, just scroll down to sample the selection of market-moving headlines that we've featured in this week's edition of our S&P 500 chaos series! 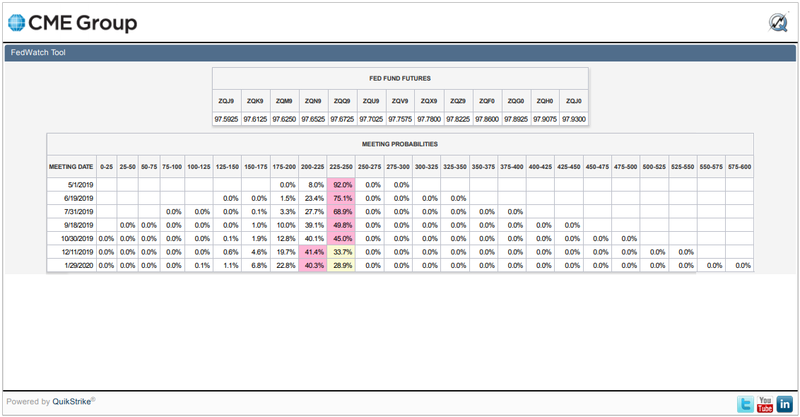 The lack of direction at the Fed coincides with an increased likelihood that the Fed will act to cut short-term interest rates in the U.S. as early as by September 18, 2019, with the CME Group's FedWatch tool is now projecting better-than-even odds of at least a quarter-point rate hike being implemented at that time or shortly after, where the outbreak of confusion at the Fed makes it more likely that the Federal Open Market Committee that sets the Federal Funds Rate will be compelled to follow the market's direction. 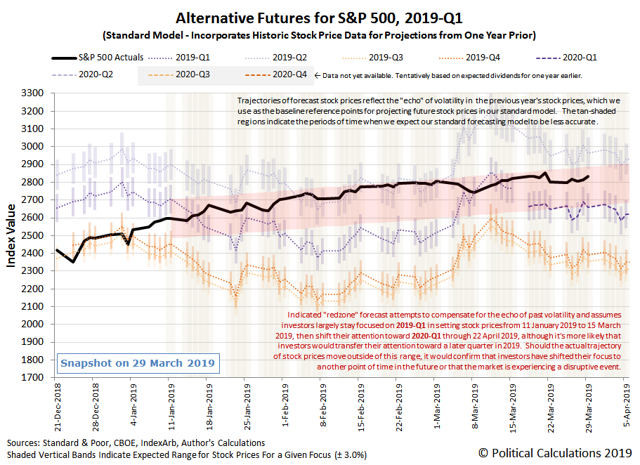 For the S&P 500 (Index: SPX), that puts the focus of investors somewhere between the current quarter of 2019 Q2 and the more distant future quarters of 2019 Q3 and Q4, which coincidentally keeps the trajectory of the index within the projection of the redzone range we've featured on our spaghetti forecast chart during the last ten weeks. Let's move on to the major headlines that splashed across the news wires during the last week of March 2019, where if you can tell what unified direction the members of the Fed are going to go from the statements they made, you're probably ignoring everything they said! The beginning of the return of QE? If you took all the economists at the Federal Reserve, and laid them out end-to-end, you would never reach a conclusion. Elsewhere, Barry Ritholtz outlined the positives and negatives that were to be found in the week's markets and economy-related news, if you're looking to get a bigger picture of the week's events sans the Fed.